We are pleased to inform our business partners that Interšped-B on 09/12/2016. got Excellent SME (Small & Medium Enterprises) in cooperation with the Serbian Chamber of Commerce. Electronic certificate “Excellent SME” is a certificate (certificate of solvency) designed in the spiritof the EU Directive on the promotion of successful companies, as well as increasing transparency and security of business and consumer protection. 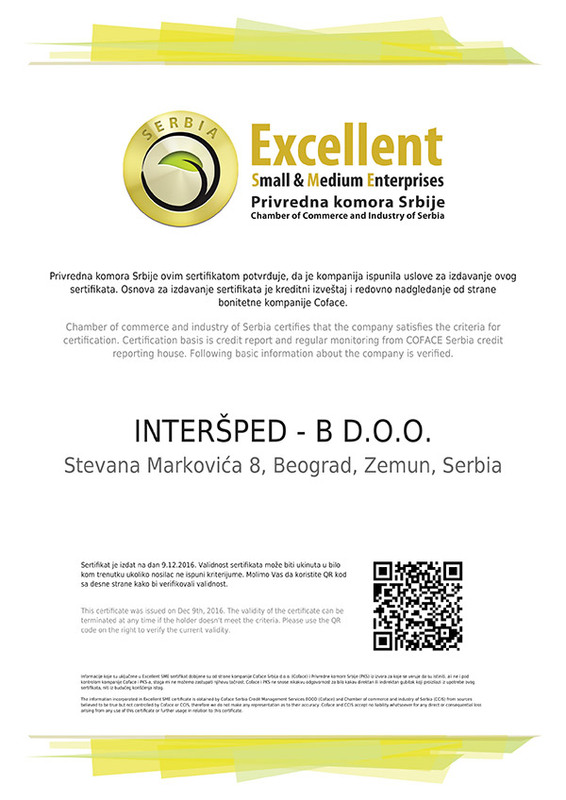 Electronic certificate “Excellent SME” award Serbian Chamber of Commerce, in cooperation with Coface, which is a leading provider of business information and receivables management in Central and Eastern Europe, whose activities cover the entire cycle from customer profiling to credit reports and receivables management, and risk assessment for 157 countries. The certificate is based on SafeSigned technology sites, and its presence on the web – page testifies to the effectiveness, accountability and credibility of the company.